Here it is! A video your child will watch over and over again -- with lasting rewards! The Joyful Mysteries of the Rosary, a reflection on the early life of Jesus, has been a mainstay of Christian prayer. And now, in this program, that same rosary is a source of joy for God's littlest children. 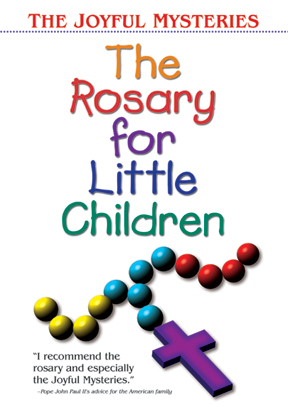 In The Rosary for Little Children, your child will join a lively chorus of children in a heartfelt journey to Jesus. Led by a heavenly visitor, portrayed by Broadway actress Jennifer Naimo, children will learn the mysteries of Christ's life. And they'll learn how to pray for their families, the Church and children with special needs. Original music and exciting visuals are guaranteed to keep your little one's attention. You'll find yourself watching and praying with your child! ?